The Intensive Spanish Language program allows students of all language levels to focus on language improvement in a short timeframe. Regardless of the session a student chooses, this program allows for improvement of Spanish language skills through diverse and engaging learning activities, or by attending a conversation club where students can share experiences. Renowned for its natural beauty, enlightened conservation, and friendly people, Costa Rica draws visitors from all over the world. 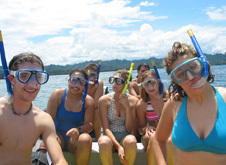 CEA students can look forward to experiencing the Costa Rican attractions and lifestyle through trips to Arenal Volcano, natural hot springs, and waterfalls. They'll explore tropical forests and experience first-hand the unique Afro-Costa Rican culture of Puerto Viejo.